Previously, we looked at how accurate fantasy football rankings were for quarterbacks and tight ends. We found out that rankings for quarterbacks were quite accurate, with most of the top-ranked quarterbacks in the preseason finishing in the top 5 at the end of the season. Tight end rankings had more variation, with 36% of the top 5 preseason tight ends (over the last 5 years) actually finishing outside the top 10! Now it’s time to move our attention to the running backs and wide receivers. Just like before, I went back the previous 5 seasons and found ESPN’s preseason rankings. For each season I recorded where the top preseason players finished at the end of the season, and also where the top players at the end of the season were ranked before the season started. With quarterbacks and tight ends, I only looked at the top 5 players. But since more running backs and receivers are drafted, I’ll look at the top 10 players. Now let's analyze the data using Minitab Statistical Software. How did the top-ranked preseason RBs and WRs finish the season ranked? Let’s start by looking at how the top-rated preseason players fared at the end of the season. I took the top 10 ranked preseason RBs and WRs for each season from 2009-2013 and recorded where they ranked to finish the season. 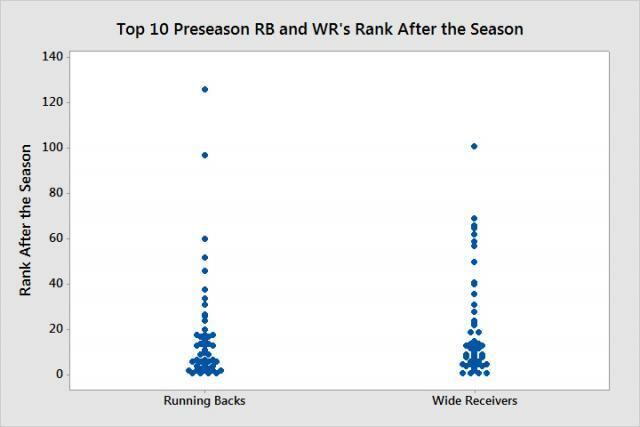 At first glance, the individual plots show that the spread for running backs and wide receivers appears to be about the same. But the descriptive statistics tell a different story. The 3rd quartile value (Q3) is the most telling. 75% of preseason top 10 running backs finish in the top 18, while that number rises all the way to 28.75 for wide receivers! In fact, 32% of wide receivers ranked in the top 10 in the preseason finished the season outside the top 20, while the same was only true for 24% of running backs. Running backs do have the biggest outlier (when Ryan Grant had a season ending injury in his first game of 2010 and finished as the 126th ranked running back), but injuries like that are random and impossible to predict. 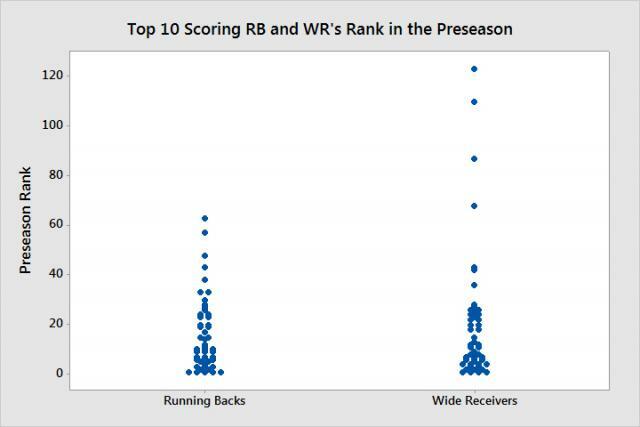 Overall, preseason ranks for running backs are more accurate than for wide receivers. How were the top-scoring RBs and WRs ranked in the preseason? Let’s shift our focus to later in the draft. How often can you draft a lower-ranked running back or wide receiver and still have them finish in the top 10? Wide receivers have had more players come out of nowhere to be top 10 scorers at the end of the season (Victor Cruz in 2011 and Brandon Lloyd and Stevie Johnson in 2010 were all ranked 87th or worse, yet finished in the top 10). But the descriptive statistics indicate a pretty even distribution otherwise. 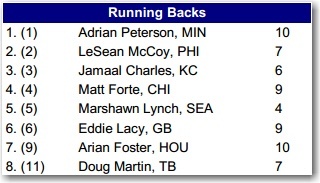 About half of the top 10 scoring RBs and WRs were not ranked in the top 10 to begin the season. And 25% of players were ranked outside the top 25, yet were still able to finish in the top 10. For both positions, there are frequently lower ranked players that exceed expectations and finish in the top 10. But if you want one of the best players, say top 3...can you afford to wait or do you need to select a top ranked player early? The following table shows the 3 highest scoring players for each year, with their preseason rank in parentheses. Since 2009, nine different receivers finished the season in the top 3 despite being ranked outside the preseason top 10. That’s 60%! And two of those players were ranked outside the top 100 in the preseason! But amongst all the inconsistency is Calvin Johnson. He’s the only wide receiver that is listed more than once. And he’s finished as the #1 ranked receiver 3 times in a row! Meanwhile only 4 running backs (27%) were able to finish in the top 3 despite being ranked outside the preseason top 10. Right now in ESPN’s average draft position, the 10th running back is being drafted with the 19th overall pick. So before the 2nd round of the draft is even over, there is a good chance that the top 3 running backs have already been selected. Compare that to wide receivers, where the 10th receiver is being drafted with the 34th overall pick. So in the middle of the 4th round, a top 3 wide receiver (or even two) could still be on the board! You can definitely wait to draft a wide receiver. The same can’t be said of running backs. So how should you use this information in your fantasy football draft? It’s not that the running back you pick is guaranteed to have a great season, but we just saw that, on average, 10 running backs are being selected before the end of the 2nd round! After that, your chances of picking a top running back start to diminish. At least one of your first two picks should be a running back, if not both! However, keep in mind that selecting RB/RB with your first two picks can be a high-variance strategy. Consider that last year, in a 10-team league you could have taken Jamaal Charles and Matt Forte with the 6th and 15th pick respectively. Those players finished as the #1 and #3 RB, and if you didn’t win your fantasy league you definitely made the playoffs. Of course, you could have just as easily picked C. J. Spiller and Stevan Ridley, who finished 31st and 26th. Unless you got really lucky with your later picks, you could say hello to the consolation bracket. If you want to play it more conservative, this data analysis pointed out a few other options. We know that quarterbacks are the most consistent position (Aaron Rodgers in 2013 aside), and this year Peyton Manning, Aaron Rodgers, and Drew Brees are the top 3 ranked quarterbacks. Spending an early pick on one of them should give you a consistent scorer who is much less likely to be a bust than an early running back. Calvin Johnson and Jimmy Graham are also two very consistent players at two very inconsistent positions. Both players have finished in the top 3 at their position for the last 3 years (with Johnson finishing #1 all 3 years). You should feel just fine using your first two picks on one of these players and a running back. But use caution on selecting a different TE or WR with an early pick. Wide receivers have the least accurate preseason rankings. Half of the preseason top 10 finish outside the top 12, and 25% finish outside the top 28! Because of this, there is value to be found later in the draft for wide receivers. Try to identify some wide receivers you like in later rounds, and focus your early picks on other positions. This example is a bit extreme, but last year in a fantasy draft I spent 4 of my first 5 draft picks on running backs (with Jimmy Graham being the non-running back pick). I was able to do so because I was fine getting Eric Decker (preseason #20) and Antonio Brown (preseason #24) in the 6th and 7th rounds. They finished as the 8th and 6th ranked wide receivers. Obviously I got a little lucky that they were that good, but that’s kind of the point. I like to think of fantasy football picks as lottery tickets. You could hit the jackpot with some players, win a decent amount with others, and have some that are busts. After the first few rounds, wide receivers have a better chance of being winning lottery tickets than other positions. Now, you don’t have to completely neglect the WR position before the 6th round like in the example above. Just know that you’re putting the odds in your favor by waiting to draft the bulk of your wide receivers. Who Needs a Backup QB? One last thing while we’re on the lottery ticket analogy. Let’s say you draft one of the top quarterbacks (Manning, Rodgers, or Brees). Don’t draft a backup quarterback! We already saw quarterbacks have the most accurate preseason rankings. By the time you draft a backup, it’s unlikely that lower-ranked player you choose will rise into a star that you will start each week or be able to use as trade bait. And on your QB’s bye week, you can easily pick somebody up off the waiver wire. So why waste that pick on somebody with very little upside? Even if you’re picking in the 100s, there is still value to be had! Josh Gordon, Alshon Jeffery, Knowshon Moreno, and Julius Thomas were all ranked outside the preseason top 100 last year, and all turned into great fantasy players! Want to take this idea to the (slightly crazy) extreme? If you have a late first round pick, try and use your first two picks on Jimmy Graham and one of Manning, Rodgers, or Brees. With your QB and TE position locked up, spend your next 12 picks on nothing but RBs and WRs. Then use your last two picks on a defense and kicker! I know this goes against the advice of focusing on running backs early, but I did say it was a slightly crazy and extreme strategy! If you can get lucky and find a winning lottery ticket with a lower-ranked running back or two (maybe Montee Ball, Ben Tate, Andre Ellington), it could even be a winning strategy. If you decide to try that draft strategy, let me know how it goes! And whatever strategy you use, good luck with your 2014 fantasy football season!